As part of the above-mentioned project commissioned by the Agency for Cultural Affairs (re-commissioned by the Nara National Research Institute for Cultural Properties), we conducted the third on-site survey for 2017 (from September 17th through October 2nd) by dispatching six members, including three outside experts. This time we conducted structural behavior monitoring, surveys on traditional building and production techniques, material experiments, and so forth. In the structural behavior monitoring checked for the third time, no progress was found in deformation of the three monitored buildings in particular. However, part of the crack gauge had come off due to damage by birds or animals, and therefore, continual monitoring could not be performed at some of the measuring points. Therefore, we took measures according to the on-site situation by covering crack gauges or switching to crack disks. The heritage building has various values: not only its appearance but also the techniques used for its construction. Regrettably, in the conventional restoration work in Bagan, people were scarcely aware of the conservation or reproduction of original techniques. And also scarce studies on such techniques are precious few. 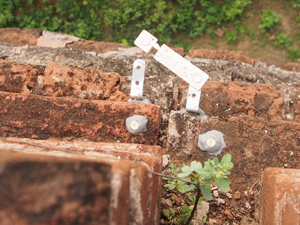 Thus, for this survey, we checked the bricklaying techniques in 20 buildings together with experts in building structure and conservation/repair. 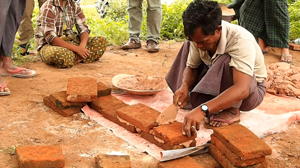 We also collected information on production techniques of traditional buildings through interviews and demonstrations with local bricklayers involved in repair. 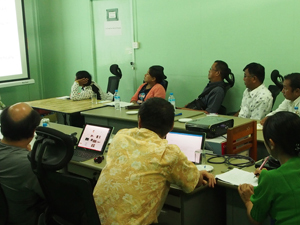 As part of our technical assistance, we delivered lectures at the Bagan Branch of the Department of Archaeology and National Museums, the Ministry of Religious Affairs and Culture in Myanmar for its 13 staff members, including the Deputy Director of the Bagan Branch, on September 20th. The three lectures were given in an omnibus manner: “Seismic damage of masonry cultural heritage in Asian countries” (Masahiko TOMODA, Head of the Conservation Design Section of the Tokyo National Research Institute for Cultural Properties); “Surveys for Structural Analysis of Brick Cultural Heritage Buildings and Their Cases” (Professor Mikio KOSHIHARA, the University of Tokyo); and ”Conservation and Repair Work for Former Winery Facilities of Chateau Kamiya” (Yasuo NAKAUCHI, Adviser, the Japanese Association for Conservation of Architectural Monuments). The audience showed much interest in reinforcement materials and techniques in particular. On the other hand, in Yangon, we conducted compressive strength tests for single bricks (14 pieces) from September 23rd through October 1st in cooperation with the Myanmar Engineering Society (MES) and Yangon Technological University (Y1TU). 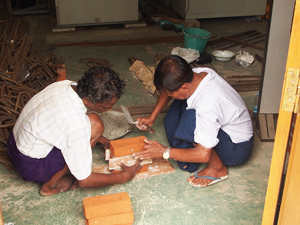 In addition, we manufactured prisms (four-layered brick specimens) using three types of mortar that differed in materials and mix proportions based on the information obtained from the production technique survey in Bagan (nine in each type), cylindrical mortar specimens (three in each type), and square mortar specimens (three in each type). We are planning to conduct strength tests for these specimens about two months later. We hope to accumulate more data useful for conservation and repair of the cultural heritage buildings in the Bagan area through such surveys and experiments.